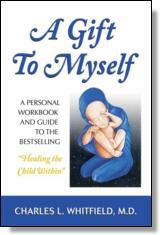 This is a gentle and effective workbook and guide to Healing the Child Within. It can be used with or without having already read Healing the Child Within. Using numerous experiential exercises that the reader can do at their own pace, physician and author Charles Whitfield takes us on a healing journey into our inner and outer life. Once a reader starts this book, the healing process begins -- even if they rarely do any of its exercises. One of the highlights of this book is the clear description of age regression, one of the most crucial concepts in healing and recovery. Charles L. Whitfield, M.D., is a physician and psychotherapist in private practice in Atlanta. He is a nationally known speaker and the author of Memory and Abuse, Boundaries and Relationships and the national bestsellers Healing the Child Within, A Gift to Myself, and other books shown below.